Manyin (fourth right), Jisin (fifth right) and STU members cut the 50th anniversary cake. KUCHING: Sarawak Teachers’ Union (STU) has been challenged to submit a blueprint to the Education Ministry to get English to be the medium of instruction in schools in Sarawak. 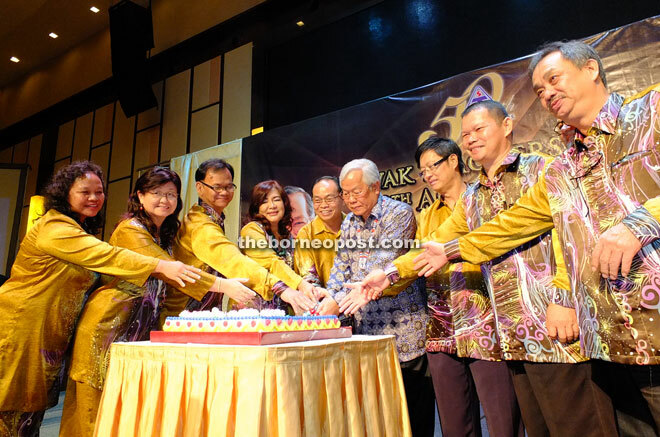 Minister of Infrastructure Development and Communication Dato Sri Michael Manyin Jawong, who issued the challenge during STU’s 50th anniversary dinner here on Saturday, argued that the survival of future generations depended on their mastery of this universal lingua franca. He, however, was quick to stress that he was not suggesting shoving aside Bahasa Malaysia. “A lot of our graduates cannot find jobs because they are not fluent in English. They depend more on the private sector to find jobs. In a borderless world, he said the young generation must be proficient in the English language. He said he had strong feelings about this, and urged STU to submit the blueprint to the Education Ministry to let students in Sarawak to continue using English in schools. He recalled that about five to six months ago, a federal minister disclosed that 162,000 university graduates were still unemployed. During TV3’s ‘Question and Answer’ programme on Wednesday, Chief Minister Datuk Patinggi Tan Sri Adenan Satem also spoke of the need for more emphasis on the English Language, besides Bahasa Malaysia. “The English Language cannot be sidelined because it is a universal language, widely used in engineering, science and technology and so forth. We can lift up both English and Bahasa Malaysia. More importantly, we do not want our education policies to flip-flop every time a new education minister takes over. “It is hard for people to cope with all these confusing changes,” said Adenan, highlighting the short-lived implementation of teaching Science and Maths in English. Manyin also suggested that rural schools be centralised because of the insufficient number of qualified and specialist teachers. Arguing the move would result in improvement in education standard, he, however, admitted that parents were reluctant to send their children to faraway boarding schools. “To produce quality students in rural areas in the next 10 to 20 years, we have to think about centralising the small rural schools, which only have 50-100 students. This will enable the students to get quality education. He also urged the union to conduct an aggressive recruitment as presently its members constituted only 40 per cent of the teaching population in the state. In his speech, STU president Jisin Nyud said with the increase in membership, STU had purchased four buildings – two in Kuching and one each in Sibu and Miri – to serve members better. He revealed that STU had been working with other unions, local institutions and insurance companies to ensure that its members and their family members get to enjoy lots of benefits. “The most important partnership is with the state education department, ministry and local government. Only through their support, cooperation and effort that STU can remain relevant and further the interest of its members. “This has enabled our workforce to remain strong, as we continue to play a meaningful role in the development of the state and country,” said Jisin. He added that STU was always mindful that education played a crucial role in sustaining and improving the quality of life of Malaysians and in creating a better future. At the event, Manyin announced an allocation of RM50,000 for the union.